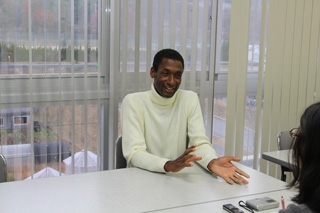 You are the only Jamaican student in Hiroshima University at present, aren’t you? Well, yes. My nationality has not really been an issue in my day to day life here at HU. I think I have been able to operate as just another international student which is ok for me. But I guess it may be special in that you have the chance to “represent” your country in a way. You are able to give a snapshot or idea about your country or what Jamaican’s are like. Also I think the advantage is that you get to pave the way as it were for other students to be able to access education here at HU. But it was quite interesting that when I first came to HU, I realized that my lab mates were expecting that I would have what you would call dread hair, like Bob Marley. They were expecting me to have that. When I got here they were a little disappointed that I didn’t have that hair (laughs). What province are you from in Jamaica? I’m from a parish called St. James. I think it may be the size of or a bit smaller than Kure City. The country is divided into municipalities called “parishes”, which is a little different from the province concept because they are not autonomous. So they all have to report to the central government in Kingston. The majority of the functions are carried through the central government. Your official language is English. Could you tell me something in the Jamaican dialect? Well, I give you the Jamaican dialect version. It is “Whap’n?” Literally it means, “What’s happening?” We made it shorter. Interesting! 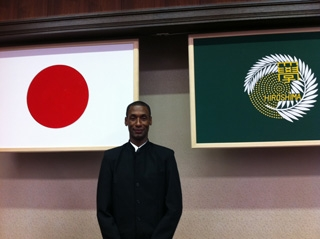 Anyway, why did you decide to study abroad in Japan? 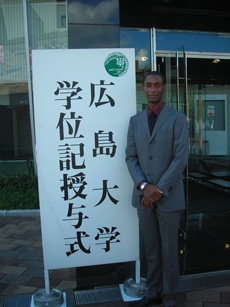 I graduated university in Jamaica, and came to Japan after having worked for a few years in Jamaica. My first experience was as an assistant English teacher at high school. I did that for three years. And in trying to decide what was next for me, I was looking at doing my master’s degree. Fortunately, I was able to apply for and receive the MEXT scholarship to study at HU. I guess to answer your question about why I came to Japan, I guess it was out of cultural interest in the first place. I wanted to experience a land, and meet people who I had very little knowledge about, as in very little contact with on a day-to-day basis. Wasn’t it difficult to prepare for entrance examination? Well, in my case, the entrance examination for the master’s course for IDEC (The Graduate School for International Development and Cooperation) was not very difficult. Also I was able to find information for example, in the Central Library. With guidance from my supervisor I was able to get through the preparation for the entrance examination so it wasn’t that difficult. And it was in English as well so for me that wasn’t a problem. What was your first impression of Hiroshima? I found that Hiroshima was very laid-back. The pace of life in Hiroshima is a little bit slower than I thought. Hiroshima City is comparable with larger cities such as Tokyo and Osaka, but it also has tradition. It has the world appeal through its world heritage sites, it’s own uniqueness, it’s own tradition, very close. So you are able to get a little bit of all Japan while living in Hiroshima, which for me was wonderful. Yes, as an English teacher. At a private language school, I assist in English conversation for students ranging from junior high school up to university level and for adults, and some business classes. That’s why you speak a little slowly for me. I have begun to do that as a habit, it seems. Having gone through a high school for example, when I was an ALT (Assistant Language Teacher). 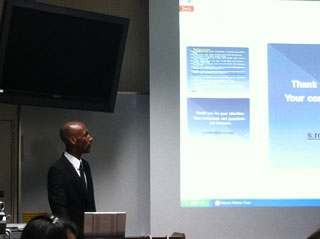 I do it because it is my aim to be understood, more so than to show that I can speak English. It is important to be understood by the person who is listening to me. Cooking is something I like to do. I like to experiment a lot. I cook miso soup with tomatoes (laughs). In terms of travelling, I have been to most of the prefectures in the Chugoku Region. Also I went to a few places including Hokkaido, Okinawa, more popular cities like Tokyo, Osaka, Kobe. Recently I went to Tokushima, too. I also have done things like mountain hiking with colleagues and friends when I was an ALT. And, music, yes! The genres that I like are fairly many though. It ranges from of course reggae which is a traditional type of music in Jamaica to opera and “Zydeco” from the southern United States and you know the aboriginal music of Australia using the “Didgeridoo” . My taste for music spans different genres but mostly what I do these days is gospel music. I serve as one of the members of the music team at my church near Hiroshima City. It can be rock, pop, traditional, classical or acappella, but all within gospel music. Tell me a little bit about student life. 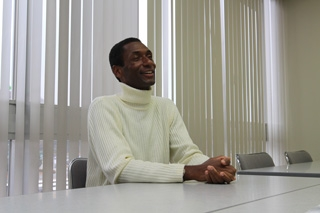 Is there a big difference in student life in Japan and Jamaica? The main difference I can recall is the level of involvement of students with one another. For example, there are events here such as “Yukata Matsuri” which are school events. I think a similar event in my home university would have been much more integrative and it’s partly because it’s a dormitory university which means that the student halls, - we call them halls of residences, are an integral part of the university campus itself and so students have much more access to each other even though they might live in different halls of residence. The student life is built around their participation and even students who don’t live in the halls of residences are attached to one of them. Japanese students, on the other hand, seem a little more isolated to me. I see. What are you studying at IDEC? I’m currently studying “cross-border education”. Specifically, this is university education that is supplied by an institution in a country that is different from its home country. 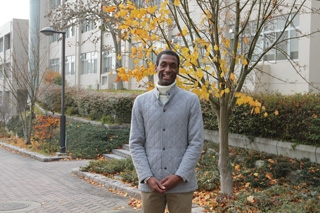 For example, a university in the United States might offer programs to students in Jamaica. It can be by distance learning or by online learning or it can be that a lecturer or professor goes from university to Jamaica to teach classes. My research now has to do with specifically about those universities and colleges from outside Jamaica that offer programs of education in Jamaica. What is the effect that these programs have had on the development of university education in Jamaica? In other words, I want to describe the current situation in Jamaica. By doing that, we will have a better idea of how best we can use the relationships that are formed between institutions in order to give our students the best chance at university education. We do realize that our local institutions cannot satisfy the demand for university education so we do need the help, but we need to ensure that the help that we are receiving is the help that we really need and that that help is really going to benefit us as well. So that’s what I’m trying to describe - the situation in Jamaica. Tell me about the current education system in Jamaica. It is most similar to the British system particularly at the high school level where we still have what we call the sixth form institutions or sixth form high schools. This means that a student can spend up to seven years in high school which would be equivalent to junior high school, senior high school and one more year in Japan. I should say however, that what I have just described is the mainstream, but we also have separated junior and senior high schools in Jamaica as well as combined 5-year institutions. Our academic years start in September, and our matriculation system for entering university is modelled after the British one. How about the university entrance rate of Jamaica? Right now the percentage of students that do go to university after high school is around 30%. Maybe 1 in 4 students can go directly to university after they finish. Many people choose to wait though and get a job and then go to university afterwards. Maybe the main issue is finance. How about scholarship system? Isn’t that enough? Not nearly enough. I think there is still a need for more support for access to tertiary education and university education. We do have a student loan system but it has been acknowledged among the education policy makers in Jamaica that it is not enough for the number of students who actually want to go to university. We are currently in Jamaica seeking ways of being able to expand that student loan system. I guess there are philanthropic organizations that are interested in offering scholarships for university education. They are available but they are not nearly enough for the number of students who want to go university. I see. By the way, could you tell me what the strongest point of Jamaica, the key to success is? I would say our “creativity” is our strongest point followed closely by our “resilience”. Concerning “creativity”, I think one of the blessings of being such a multicultural society is that we have different viewpoints and that we have the wisdom of different cultures coming to Jamaica and abiding in Jamaicans. I think we do have that ability to be very creative and use that as an engine for productivity. The second thing I said was “resilience”. The historical experience of Jamaicans has been negative – we went through 300 years of slavery as a colony of the United Kingdom, of England in particular. In coming out of that experience and wanting to create a nation that has a good standing in this world, I think Jamaicans have had to be very resilient in this world. Is there any advice you can give to students who plan to study abroad? For students specifically, it would be two things: One is to be open - to be very open to the experience of studying abroad. Maybe you would think that you know a lot about your destination, but don’t allow that cause you to close yourself off from the experiences that are outside of your own knowledge. The same applies to human relations. Be patient, be open. It may take time to make a genuine Japanese friend. For me that’s worth it. When you do become a genuine friend of someone here in Japan, then you know that’s something real. The second thing would be to be clear about what your goals are for study abroad. I think students - particularly students who come on scholarship may have an idea about what they want to study. But my experience has been that many students tend to waste their time meandering along, trying to find their way. In hindsight, I would say that somebody who is interested in study abroad should have a clear goal in mind as to what he or she wants to achieve at the end of their study abroad period. Doesn’t matter how long it is. It can be three months. It can be three years - have in mind a goal for your experience. Thank you very much. Last question. What is your future goal? Career wise, I would like to be involved in policy making and planning for higher education for university education or tertiary education in general in Jamaica. A system that is clearly and ably managed, which students can find very useful and helpful, in gaining access to higher education. Overall, my personal goal is embedded more in my Christianity than anything else. It’s to share who I am and to share the blessing that I have received from God with as many persons as I can. I want to share the knowledge of God with those persons who want this knowledge.